USPS offers packaging that can only be used when shipping with USPS. There are various types of packaging that USPS provides. If you use a USPS service that doesn’t correspond to the postage rate selected it can cause either the package to be returned to sender or the shipment may incur a postage adjustment. USPS offers Priority Mail and Priority Express Mail packaging that can be used when shipping with these specific services. These are branded as USPS mailers that are not tied to a specific rate and can only be used when shipping with USPS. The postage rates must be either Priority Mail or Priority Mail Express and are determined by the weight and destination of the package. The postage label must match the Regional Rate box used. Reference our handy guide to help you determine when to use Flat Rate or Regional Rate packaging. Winter is here and we wanted to advise our clients of some service delays that carriers have been experiencing due to cold weather. Severe winter weather conditions in Northern and Midwest regions of the U.S. are impacting package processing and delivery resulting in delays. Carriers are working to ensure the safety and well-being of workers and minimize the effects of the weather disruption on service. Find more details for carriers on their service update pages provided below. Don’t forget to advise your customers accordingly. Dimensional weight changes won’t be implemented until June 23, 2019 to allow time for adjustments. Rate cards will be updated on the website soon. As the year is winding down, we wanted to give a heads up for the annual postage rate increases that are scheduled in January 2019. Correction to our previous post. USPS will suspend regular mail deliveries and close retail services tomorrow, Wednesday, Dec 5. Chit Chats will still be able to hand off packages to USPS tomorrow morning however there may be processing and tracking delays with USPS. Packages dropped off on Tuesday, Dec 4 at a Chit Chats branch will be handed off to USPS on Wednesday, Dec 5. President Donald J. Trump has proclaimed Wednesday, Dec. 5, 2018, as a National Day of Mourning in remembrance of former President George H.W. Bush. As mentioned this may affect delivery times and tracking updates with USPS. This will not affect processing times for our Chit Chats Canada Tracked, Chit Chats International Standard, Asendia and UPS Mail Innovations packages. Below you will find shipment processing times for the upcoming American Thanksgiving Holiday which falls on Thursday, November 22, 2018. Please keep in mind that there may be some tracking delays as it is a U.S. holiday. We recommend planning in advance and to advise your customers accordingly. Deliveries resumes Friday, November 23, Saturday, November 24. No deliveries tomorrow, Thursday, November 22 to Sunday, November 25. Deliveries will resume on Monday, November 26. Manifest shipments received between Wednesday, November 21 to Sunday, November 25 to be delivered off to AMS on Monday, November 26. Chit Chats Canada and Chit Chats International will not be affected. We have added deadlines for our International carriers and we have adjusted a few deadlines based on the higher volumes expected for the season. We have also included dates for Alberta in preparation for the opening of our Calgary branch. It’s that time of year – the holidays are around the corner and we know that you probably want to set shipping deadlines on your website to ensure orders get to your customers in time. To help you plan ahead we’ve gathered shipping cut-off dates for the different carriers so that shipments arrive before December 25, 2018. We’ll also be releasing our holiday hours of operation soon. The days leading up to Christmas fall on a weekend. Carriers have limited hours over the weekend, so be sure to plan accordingly. Carriers typically extend or suspend their service guarantees around the holidays. If your package needs to arrive by a certain date, make sure you’re aware of these changes. Visit the respective carrier websites for more details. Most carriers will suggest mail-by dates for the holiday season. Find the recommended deadlines below. 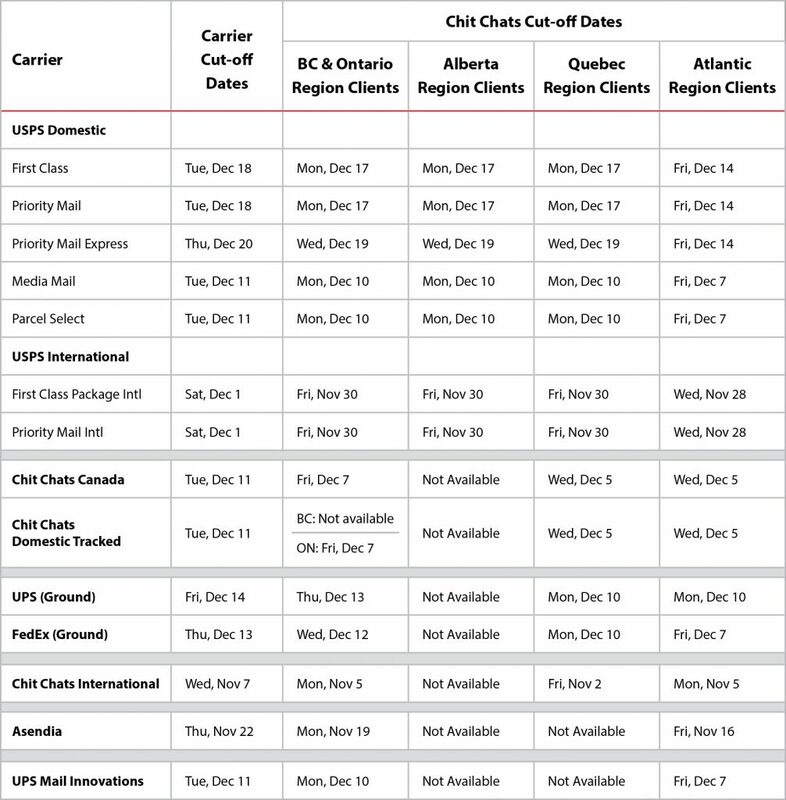 Don’t forget packages need to be received by Chit Chats prior to the cut-off dates for carriers and this varies by region. We’ve added region specific cut-off dates for BC, Ontario, Quebec and Atlantic. What is a postage adjustment? Carriers have different methods of verifying that correct postage rates have been paid by the shipper. Previously if postage was underpaid, packages would be returned to sender or the recipient would be required to pay the postage due on delivery – not the best experience for your customers, as it would delay packages or require them to pay postage due upon delivery. On the other hand, if any postage was overpaid, there wasn’t a way to offer a credit back to you, the shipper. What shipments will be affected? USPS recently deployed an automated process for verifying that the correct rate has been paid for shipments. This new automated process called Automated Package Verification (APV) allows USPS to determine if postage is either underpaid or overpaid. USPS has begun passing back postage adjustments to us and in order to keep our rates low and provide the best shipping options we will soon implement postage adjustments. To be consistent with USPS and the other carriers we support, postage adjustments will apply to all carriers and all postage types. By ensuring postage is paid correctly we can continue to offer the best shipping prices and options to you. For the majority of our clients, this will have little impact. The shipping process remains the same and postage adjustments will apply to shipments with incorrect postage paid. Postage adjustments will also update the corresponding delivery fee if applicable. Misrepresentation of any of these details is considered an act of mail fraud and may result in the deactivation of your account. Over the next few weeks we will be sending further updates for postage adjustments applied to your account. Postage adjustments will apply for both underpaid and overpaid postage. If delivery fees are applicable they will also be adjusted based on the postage adjustments. You will see these adjustments within your transactions summary. Reference to the shipment ID will be in the transaction so it will be easy to identify which shipments the adjustments are tied to. The USD to CAD conversion will be the same rate that was applied at the time the original postage was purchased. Looking for an alternative to Canada Post during the possible strike? Chit Chats is your shipping solution. In the face of the looming Canada Post strike, Canadian businesses can rely on Chit Chats to provide a cost effective shipping option that offers value added services like tracking, insurance and faster delivery to the U.S. and worldwide. Offering access to USPS postage and other carriers, businesses can use Chit Chats to alleviate concerns of how the strike will impact their shipping. A Canada Post strike would cripple many businesses as they rely on the mail service not only to ship their products but many businesses also rely on Canada Post to get paid or pay suppliers. By choosing Chit Chats, businesses can take advantage of cheaper shipping options when compared to Canada Post can save businesses up to 70% on postage costs. Not only can you save up to 70% on postage, you can easily get estimates and create postage labels from the comfort of your home. Chit Chats does utilize Canada Post for shipments destined within Canada and the team is working on offering a solution should Canada Post go on strike. Please be aware that if Canada Post does strike, there may be delays with any Canadian bound shipments that are in transit during the time of strike. Updates on alternatives will be provided as soon as details are confirmed as we have received many inquiries from businesses who are worried about how this will impact them. Understanding businesses and being able to help Canadians is part of Chit Chats mission. From humble beginnings, Chit Chats started out of a green station wagon and Derek Nolan’s efforts to reduce shipping his books from Canada to the U.S. He realized he could drive across the border to the U.S. himself and thereby take advantage of the United States Postal Service to ship his books to his customers at a fraction of the price of Canada Post. Before he knew it other book sellers started paying him to take their books and Chit Chats was born. Having seen how difficult it was to compete in the ecommerce world, Derek Nolan saw the biggest pain point for many businesses were shipping costs. Chit Chats offers an option beyond Canada Post where it not only levels the playing field, businesses can start growing by opening up their market place beyond Canada where they once thought they could not compete. Sign up for a free account and start saving today. We previously communicated some restrictions specific to the transportation of batteries which fall under the Hazardous Materials regulations of USPS. Please review the following instructions and specific restrictions on the handling, labelling and shipping of Hazardous Materials. These restrictions are in place to ensure the safety of all handlers, and to ensure the safe and appropriate transportation of the items. Please also note, if items which fall under the category of Hazardous Materials are found to be non-compliant with the following restrictions the items may be rejected and returned. The full details of these restrictions can be viewed in USPS Publication 52, Hazardous, Restricted, and Perishable Mail. Anything susceptible to damage or that can become harmful because of changes in temperature or atmospheric pressures unless protected against the effects of such changes. Magnetic material that has a field strength sufficient to cause a compass deviation at a distance of 7 feet or more from any point on the outer packaging. Flammable materials (gases, liquids, and solids). UN3090 lithium metal batteries (including lithium alloy batteries) and UN3480 lithium-ion batteries (including lithium polymer batteries). Chit Chats offers rates for USPS’ Parcel Select Service which can be used to ship Hazardous Materials which are prohibited from air transportation. The USPS Surface Transportation Only label must also be attached to shipments which contain Hazardous Material as a further assurance of the accurate sortation of the shipment. Please see one of our representatives in branch to request a label for your shipment.